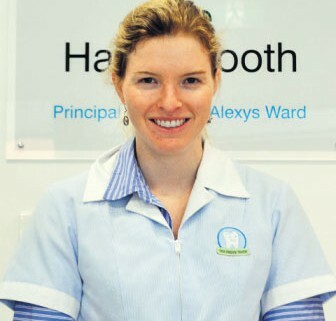 I am Alexys Ward, one of the principal dentists at the Happy Tooth Singleton. I have graduated from Sydney University with a Bachelor of Dental Surgery and since graduating I have completed over 40 additional courses in advanced dentistry. Over the past seven years I have practiced dentistry in both Sydney and the Hunter Valley. The city experience has allowed me to gain expertise in advanced dental techniques using the latest generation equipment and technology. The Happy Tooth Singleton has been fitted out with equipment of the 21st century to give you the best possible dental care, I have sought out top class equipment and facilities. I want you to have what I would want in dental treatment- treatment that looks great, feels great and lasts as long as possible. I have always adhered to the philosophy of, ‘if you are going to do something, do it well and always give it your best’. I am Charlotte Wotherspoon, one of the dentists here at The Happy Tooth. I am so excited to be part of such a vibrant and enthusiastic team. I have been working in the Hunter Valley area for over 7 years, having moved here from Sydney with a Bachelor of Dentistry, after studying a variety of Medical Sciences. I also spent a number of years working in the hospitality industry, where I gained experience working with a wide range of people. I am passionate about all areas of dentistry, from preventative and educational, through to more complex restorative cases. I enjoy working with children and adults alike. I pride myself in being a caring, loyal and honest person with a strong work ethic, aiming to provide the best possible care for all my patients, treating each and everyone equally and to the utmost of my ability. Outside work I love food and music, I enjoy to cook and entertain friends and family and when I can find the time, I love to ski. I look forward to meeting you soon! Hi! My name is Min Jin (MJ for short). I have been working as a dentist at The Happy Tooth for a little while now and have enjoyed every minute. Since graduating from the university of Sydney in dentistry with honours, I worked on the Central Coast and in Sydney, where I accumulated experience in many different facets of dentistry. Continuing education is essential to ensure that you receive the best possible treatment. As such, I keep myself informed of the most up to date techniques using the latest technology and courses. I have a bright and friendly personality and am dedicated to making sure your experience at the dentist is comfortable and you feel completely at ease. Dentistry is extremely rewarding and I thoroughly enjoy it. I believe in working with you to create a beautiful and healthy smile! Outside of dentistry, I love animals and prior to completing my dentistry degree, I was a vet. However, I am no longer practicing as I prefer human teeth! I also love to cook and try out new recipes when I get the chance! Hi I’m Kate, one of the Dentists here at The Happy Tooth Singleton. I graduated from Charles Sturt University in Orange NSW with a Bachelor of Dental Science and following my degree made the move to The Hunter. I am thrilled to be working at the Happy Tooth, a practice that strives to make the dental experience as pleasant as possible, with its welcoming, enthusiastic team and state of the art technology. As a Dentist, I have the privilege of meeting new people and helping them each and every day. I pride myself on my friendly, easy going nature and I hope to make your visit to the Dentist as comfortable and stress free as possible. I enjoy my job. It is an incredibly rewarding career and the Hunter community has been very welcoming. Outside of Dentistry I love to travel, I am a keen water skier, and enjoy trying new foods whether it is at restaurants or cafes or a new recipe at home. I look forward to meeting you all soon! Hi! My name is Jon and I graduated from Randwick Tafe with and Associate Diploma in Dental Technology in 1999. After 2 years of gaining experience throughout a diverse range of cases in the field of dental technology, I furthered my studies as a dental technician by upgrading my qualifications to a Diploma in Dental Technology. In 2004 I pursued my passion further by undertaking an Advanced Diploma in Dental Prothetices, graduating in July 2006 as a registered Dental Prosthetist. In doing so I also received the ‘Phil Harris Award’ for the best student overall. My studies continue today constantly gaining knowledge in the field of dentures and more recently implant retained dentures. In 2009 I was involved in the education of Dental Prosthetics at Randwick Tafe as the assistant teacher for implant retained dentures.